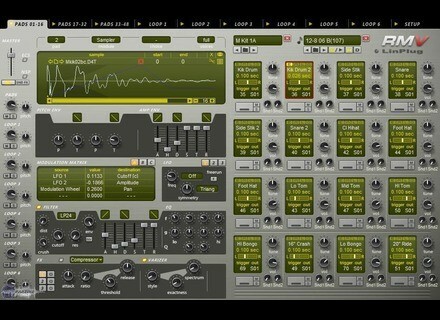 RMV Drum Addiction, Virtual Drum/Percussion from LinPlug. LinPlug has released the Mac OS X version of RMV Drum Addiction (v5.0.3). 48 polyphonic Percussion Pads for the universal or one of the more than 10 specialized Drum Synthesizers or a Drum Samplers. Each Percussion Pad and each Slice features all common and many editing parameters, ranging from Volume, Pan, Output Selection, Tune over Modulation Matrix, LFO's and Envelopes to Insert Effects and EQ's. 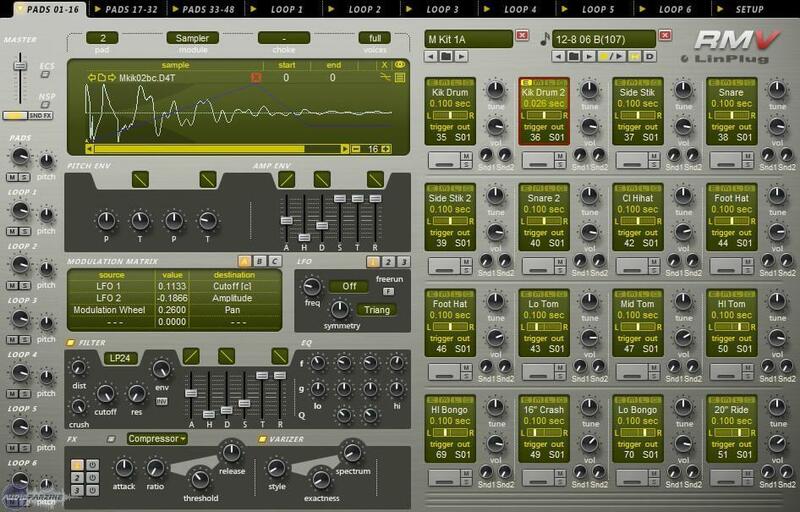 3 insert effects racks each of which can be set to one of nine different effects units. A "Varizer" for realistic humanizing. Each Sampler module can hold up to 30 samples that can be layered, velocity switched or -crossfaded and with parameters for start, end, delay and more. The Sampler and each Slicer also features a pitch and amplitude envelope. The Library contains a selection of partly multi sampled acoustic and electronic kits, synthesized kits and MIDI (partly from Groove Monkee) and Audio Loops. Four specialized "Librarians" offer search capabilities and are used for the storage and retrieval of various types of data that the RMV supports: Pads (individual drum sounds), Kits, MIDI Grooves and Audio Loops. Samples can be imported using the RMV Sample Browser (supporting favourite folders and pre-listening). Samples, Pads, Kits, Grooves and Loops can be browsed while the instrument is playing. Each Send Effect Rack can hold up to 3 individual effects and a final four band EQ. Each Audio Loop can have up to 64 Slices. Each Loop Player can be used to load and playback audio loops in WAV, AIF, REX and REX2 format. Samples are automatically sliced. Slice start and end points as well as automatic slicing sensitivity are user-definable. The license fee is $179 / €139 including more than 10,000 individual drum sounds, partly pre-compiled to 340 kits, more than 1,500 pre sliced Audio Loops, mainly from Frank Yenox Neumann, and 2,600 MIDI Grooves, partly from Groove Monkee, plus a 150 page manual in English (soon also in French and Italian). The upgrade from RM IV and RM III and is $79 / €59. For more detail, check out LinPlug's website at http://www.linplug.com/index.htm. AuraPlug Releases Fuzz-Stone Distortion AuraPlug has announced the release of Fuzz-Stone, the second plug-in in AuraPlug's Freetortion Series of free VST plug-ins for Windows. Fuzz-Stone is a '60s-styled guitar fuzz tone pedal which simulates the Legendary Stones' Satisfaction guitar tone. Starplugs Releases Free Gate Starplugs has released Free Gate, a free classic high-precision Gate effect VST plug-in for Windows. LinPlug SaxLab 2 Updated for Mac LinPlug has released it new Mac version for SaxLab 2 (v2.0.3b).